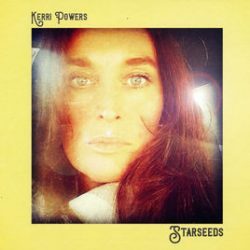 Kerri Powers newest release ‘Starseeds‘ is the first full-length album since her debut record ‘You, Me and a Redhead’ released back in 2001 and after a brief hiatus, a self-titled EP in 2014. Having had the time to hone her craft and take inspiration from her personal experience over those tumultuous years, this largely picks up where she left off with her brand of lyrically rich, vocal-driven folk music and should only see her build upon her previous successes as she expands on what made the first two records so appealing with more ambitious lyrical content and versatile musical arrangements. ‘Peeping Tom,’ the first track on the record is a lyrically vivid, steady-paced acoustic track about Lady Godiva riding into town naked on the back of a horse much to the disapproval of her husband and mirrors the current zeitgeist, exploring the relationships between men and women and although it is delivered metaphorically, reading between the lines, the song highlights how far we’ve come as well as how far we have to go and is a very clever way to kick off ‘Starseeds’ and leaves plenty to think about throughout its three minutes and beyond. The following two tracks, are very different in sound with ‘Somewhere On The Vine’ taking a laid-back, acoustic approach leading straight into ‘Bicycle Man’ – a slide guitar, blues number and it becomes clear how versatile Powers is as both a songwriter and a vocalist, lending her talents to different genres and pulling them both off almost effortlessly. It would be easy for this record to push the vocals to the forefront and rely on them to carry the record. However the musicality throughout ‘Starseeds’ is interesting and creative which sets it apart from a lot of solo records of this ilk and this is evident across all of the 10 tracks on offer here. In true folk tradition the record includes two cover versions, the first being a cover of Gene Clark’s ‘Polly’ which is largely in keeping with the original track and is a wistful, breezy ballad backed with acoustic guitar and some excellent harmonies. Likewise, a cover of Blind Faith’s ‘Can’t Find My Way Home’ is melodically in keeping with the original, albeit with a twist as it’s delivered here acoustically and with a melancholy, blue vibe as opposed to the upbeat original, however, that is not to detract from the quality here as it allows Powers to interpret the song in her own way, arguably the beauty of a cover version, and she delivers it with excellence. Other tracks on the record present a mixture of country-folk ballads, with slide guitar and Kerri Power’s powerful vocals and slide guitar (‘Rocking Boat’), acoustic vocal-driven tracks such as ‘Free Bird Flying‘ and the more upbeat, full-band blues numbers like ‘Mine The River’ which is one of the album highlights. Despite the experimentation with genre on the record, it never feels forced or unnatural and only serves to highlight the talent she has as a vocalist and versatility of her as an artist and songwriter and makes the record a most enjoyable listen from start to finish.